This guideline covers diagnosing and managing Lyme disease. It aims to raise awareness of when Lyme disease should be suspected and ensure that people have prompt and consistent diagnosis and treatment. It does not cover preventing Lyme disease. In October 2018, we corrected the information in table 2 relating to treatments for Lyme carditis in children aged 9 to 12 who are haemodynamically unstable. 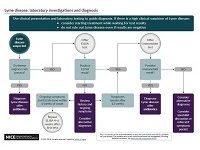 See a visual summary of the recommendations on testing for Lyme disease.